Think you know the ground beneath your feet? 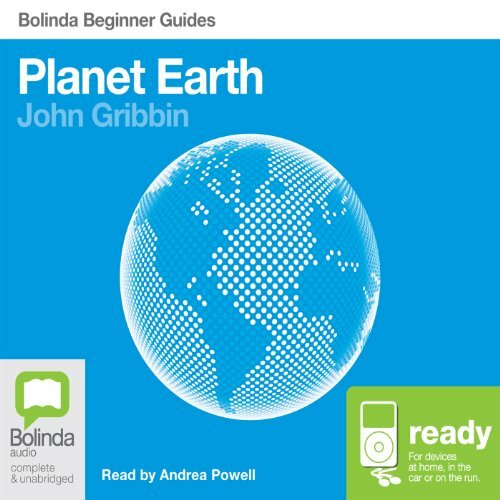 Prepare to be surprised as you listen to Planet Earthfrom the popular Bolinda Beginner Guides series. From Pangaea to plate tectonics, all your favorite concepts from fifth grade geology are here. But just as exciting as the story of our planet is the story of how our understanding of it has evolved through centuries of speculation and mythmaking to a scientific process that has given new language to our understanding and appreciation of the rock we call Earth. Narrator Andrea Powell brings a warmth and accessibility to Josh Gribbon's text. The result allows the listener to reach across time to see the world as it existed before humans were around to marvel at it. A highly entertaining and accessible introduction to our planet from the best-selling author of Schrödinger's Cat, The Scientists, and In Search of the Multiverse. In this incredible expedition into the origins, workings, and evolution of our home planet, John Gribbin does what he does best: takes four and a half billion years of mind-boggling science and digs out the best bits. From the physics of Newton and the geology of Wegener, to the environmentalism of Lovelock, this is a must-listen for Earth's scientists and residents alike. For anyone who enjoys hearing about the the birth of our universe and movements of the continents I would recommend this book. If you are familiar with John Gribbin then you will trust the contents of the book as well researched. What other book might you compare Planet Earth: Bolinda Beginner Guides to and why? Bill Bryson's "A Short History of Nearly Everything" is similar, but more expansive. Richard Fortey's "Life" also covers a lot of this material. As far as the material is concerned... the more resources the better! What does Andrea Powell bring to the story that you wouldn’t experience if you just read the book? Monotone can kill the best of books. Ms. Powell has a nice energy and a subtle accent that is easy on the ears. Fantastic insight into our planet and its place in the universe. Only drawback is that the reader is quite boring to listen to but it is well worth it.